New London Reservoir is in Huron County, in Northwest OH. The reservoir has 220 acres of fishing water with 2.63 miles of shoreline and lies in Ohio Division of Wildlife District Two(2). Approximately 30 miles southeast of Sandusky, this upground reservoir is fed by the Vermilion River. New London Reservoir offers fishing for; bluegill, largemouth and smallmouth bass, crappies, walleye, yellow perch, rock bass, green sunfish, bullheads and white suckers. There is an electric motor only restriction on New London. Below is a map, weather report, and Google Maps to help you maximize your time on the water and go fish Ohio! New London Reservoir New London Reservoir is in Huron County. The lake has 220 acres of fishing water with 2.63 miles of shoreline. This reservoir is in Ohio Division of Wildlife District Two(2). Location New London Reservoir is located in the southeast corner of Huron County in New London Township. Approximately one mile east of State Route 250 on Town Line Road it is an upground reservoir whose water is supplied by the Vermilion River. Distance from Major Cities Approximately 30 miles southeast of Sandusky. Approximately 50 miles southwest of Cleveland. Approximately 75 miles northeast of Columbus. Fishing Opportunities New London Reservoir offers; *Bluegill *Largemouth and Smallmouth Bass *Crappies *Walleye *Yellow Perch that have been stocked by the Division of Wildlife. *Rock Bass *Green Sunfish *Bullheads *White Suckers have entered the reservoir from the Vermilion River. Boating Information There is an electric motor only restriction on New London. The boat ramp ~ beach ~ and a parking area is accessible from Euclid Road which runs north from Town Line Road. 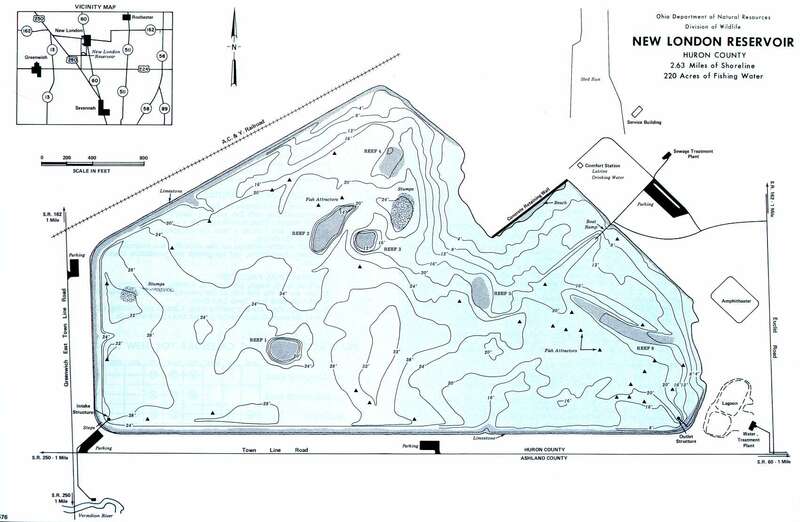 Also there are two parking areas on the south side of the reservoir with another on the west side. State Management The Division of Wildlife activities include ~ monitoring fish populations ~ stocking ~ creel studies ~ general physical and chemical water quality analysis. Fisheries research programs are also evaluating this reservoir. What's your FAVORITE way to fish?